The Monster of the Meteor is a breed of mouse found in Fort Rox. They are known to drop Ancient Relics, Animatronic Birds, Bloodstones, Dawn Dust, Divine Orbs, Flawless Orbs, Howlite, Inert Queso Dowsing Rod, Meteorite Pieces, Silver Bolts, Simple Orbs, Super Cactus Charms, Ultimate Charms, Ultimate Luck Charms, Ultimate Lucky Power Charms and Ultimate Power Charms as loot. A powerful gigantic beast that has come lumbering out of the center of the meteor which is seemingly the source of chaos stirring up all of the mayhem in Fort Rox. Looking to reclaim the stolen Meteorite Pieces of which he is composed, he is heading directly to the Fort Rox battlements to retrieve them from the very walls where they reside. This mouse carries with it great treasures and if caught will drop a handful to be used in the creation of powerful traps. Each time this mouse is caught, he becomes more enraged and your fort wall will take more damage the next time you fail to capture any mouse! Monster of the Meteor mice have no specific preference for any kind of cheese. Arcane traps are very effective against the Monster of the Meteor. Shadow traps are of normal effectiveness. Monster of the Meteor mice can only be encountered during the dawn phase in Fort Rox. Capturing the Monster of the Meteor enraged him and his company of guards. From now on, any mouse I fail to capture will do x00% damage to my fort wall! The Monster of the Meteor Mouse drops the Dawn Egg and the Monster of the Meteor Egg during the annual Spring Egg Hunt. 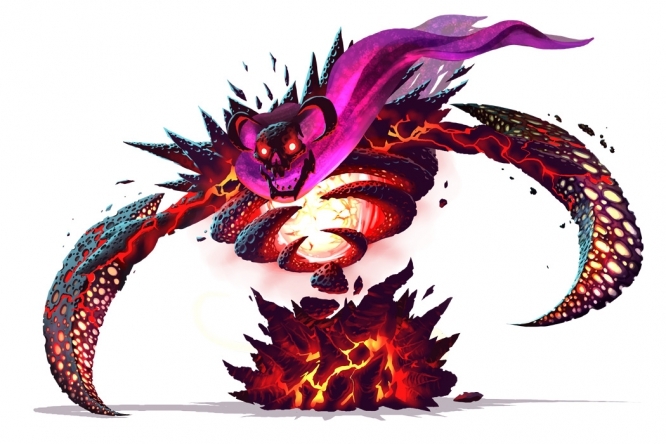 3 November 2016: The Monster of the Meteor Mouse was introduced as part of the Fort Rox release. 20 June 2018: The Monster of the Meteor Mouse began dropping Inert Queso Dowsing Rod in preparation for the release of Queso Canyon. This page was last edited on 25 February 2019, at 15:04.